Time for currently for April with Farley at Oh Boy Fourth Grade. March was gone in the blink of an eye. I'm not going to complain because that just means that we are closer to warm weather!!! Listening: I currently have Ellen on in the background as I work on my lap on the couch. The girls are having late naps after we were out all morning/afternoon at a science center and playing with cousins/second cousins. Loving: Salt and Vinegar Chips are my latest obsession. I've had them before and liked them but didn't think much of it. Then I ate them more when I was pregnant with the girls because I was obsessed with slurpees and somehow thought the two went together. I bought a bag the other day and got hooked again and have continued buying them ever since. I especially love them in a kettle chip so they are super crunchy. My husband absolutely hates them. Can't even stand the smell of them. I know they are smelly but I LOVE them!! Maybe that's why I like them so much...I know I don't have to share! Thinking: I have had a week where I feel like my to do list is out of control. I spent the beginning of the week trying to get two Easter products posted so now I feel like I have so many other things to do - blog, scrapbook, clean up the house, get ready for this weekend, etc. I've been good this week about getting up before the girls but I've also been staying up late which means less sleep. So I am giving myself permission to just relax. If I don't blog or scrapbook, life will go on. I miss my husband and we need to just hang out in the same room for a night. He has plans to work late so I'm thinking tonight might be a good night to just chill together and not do any work once he gets home. Wanting: New clothes. This is a problem for me every year. I want new stuff. My new love of instagram and blog reading doesn't help because I see stuff and want to add it to my closet. I try to be good and not buy clothes very often. I tried to get some things from Old Navy last week and struck out big time - I wanted to love Pixie pants but they just didn't look right on me. I bought a few things last weekend with my sister using her employee discount at AE. I got some jeans but I can't say that I love them or that they are super comfortable yet. I am ready to toss half the clothes in my closet because they have fuzzy balls on them. Doesn't help that after a long winter of being inactive, most of my clothes don't fit very well. Needing: We are hosting Easter dinner so I need to get to Costco and the grocery store to get the rest of the food that we need. I think I have all of my "bunny" shopping done so it is mostly just food and if a new dress for me happened to come home, I wouldn't be sad. My parents are going to watch the girls tomorrow morning so that I can do all of my running around. EGGS-plain your name: When we first got married, my husband created a profile for me on his Playstation. He put Sara J (like he would have other Sara's using it or something??) and said that sounds like a store/boutique name. So when I started making crafts and then when I started selling on TpT I used it. Plus I liked that it didn't use my full name. Even though I wasn't in the classroom when I started TpT, I was still technically employed and on leave for a year so I didn't want there to be any potential issues. Then I started adding Creations to the end but didn't officially change it on TpT. I think you can now change it without losing all of your followers and links so I might add Creations soon but I decided to use it for the blog, too. If I had to do it all over again, I probably would have thought of a cutesy name like everyone has. I didn't realize that was "a thing" when I started my store so I just used my name. But after a few years in, I don't want to change it now. I love your nickname. I LOL when you said your husband set up your profile as Sara J! Too funny!! I wish I had a nickname! I LOVE your store name and it makes it even more special that your husband randomly came up with after yall first got married. I say own and it love it. I think it is hilarious that both of our 'wanting' sections are about clothes. I like Old Navy stuff and it is reasonably priced, but I feel like most of their stuff does not fit me either. I look pregnant in everything. Do you ever look at the outfits on Pinterest? There are some really cute ones on there. I totally agree about Old Navy. It is affordable which is why I think I always go back but the pants have never fit me very well. I also feel like because it is so cheap, it doesn't last. It shrinks and balls up so quickly. I do love their Tami tank tops and pretty much wear them under everything. I bought a few of those last week to replace some old ones. I do like looking at Pinterest ideas. 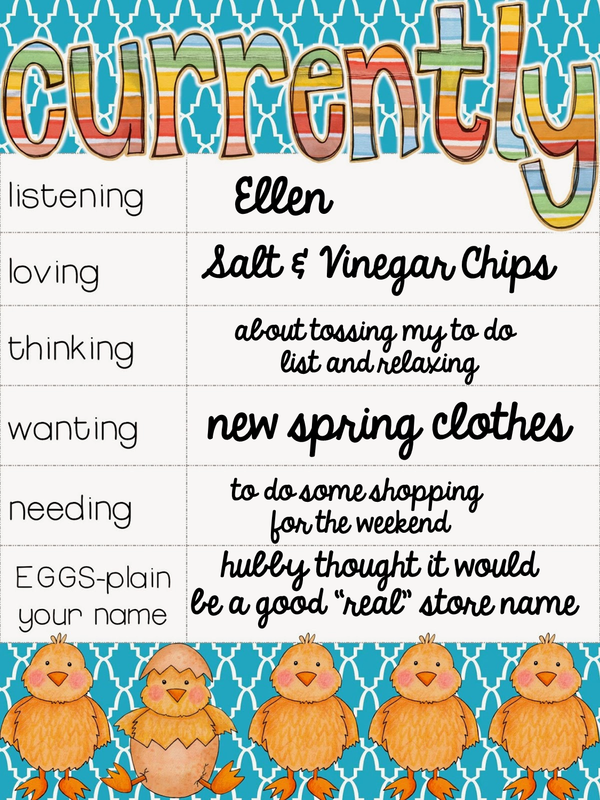 I recently added a Teacher Fashion board and a SAHM mom fashion board. Not that I'll buy any of it but at least it can give me some ideas to get out of my yoga pants rut! I love that your name was your avatar on the game...too cute! I hear ya about the list, mine is a mile long. I need new clothes too. But I am like a dog who puts on their winter "coat" every year, and I don't want to shop until I get rid of this extra weight I found this past winter. Hopefully something will just fall into your cart tomorrow that will work for you. Such a good analogy to the dog with the winter coat. I am in the same boat (and so is my dog but that's another story). I never dealt with this until I had my girls and now it seems like my body is all different. I definitely need to shed my winter coat!! I hear you on the Pixie pants too. They looked so cute on TV! I bought two pairs online and ended up returning them. Did not like the look of them or the fabric. I can usually find some cute tops from Old Navy, but not really pants. Oh well, I'm not supposed to be spending money on clothes right now anyways. lol. I'm glad I'm not the only one who can't make the Pixie pants work. I was so bummed because it seems like everyone is rocking them. I guess they aren't for everyone!